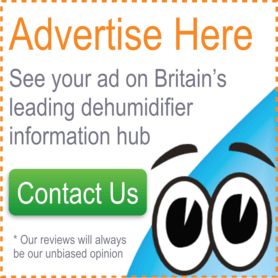 Hello and welcome to Dehumidifier-Reviews.co.uk, your one-stop-shop for all information regarding dehumidifiers. If you’ve already bought a dehumidifier then please share your thoughts with us. If you’re in the market for a new dehumidifier then this site will give you all the information you need. If you’re totally new to the thought of a dehumidifier and don’t know where to begin, the buyer’s guide below would be a great place to start. The EcoAir DC12 is a great choice for the family home due to the unbeatable blend of high extraction power, an easy to use control panel, robust construction and a price that will put a smile on your face. This is the machine that keeps the other manufacturers awake at night. The EcoAir DD122FW Classic Mk5 is currently the best desiccant dehumidifier available. It hits the sweet-spot in terms of power and quietness and comes packed with features, including an ioniser, antibacterial filter and swinging ‘3D louvre’. The Meaco DD8L has won many awards since release and is their best selling model. It’s targeted at ‘leisure’ users (e.g. sheds, boats, caravans) because of its excellent extraction rates at low temperatures, but with an antibacterial filter, ioniser and decent control panel it is equally at home in homes. The EcoAir DC202 is arguably the best domestic dehumidifier currently available, combining the best aspects of refrigerant and desiccant technologies. Firstly, it is a powerful machine, suitable for family homes of almost all sizes. Secondly, it has the most thorough air purification system on the market. Thirdly, the build quality and refinement is excellent. You should at least consider this machine. Read our review here. Decide whether you prefer a manual or digital display and controls. Those with digital displays often have many different modes and functions to choose from, while manual controls can be more simple to understand. Then take note of the capacity of the dehumidifier’s water collection tank. These can range in size from 500ml to 6 litres. The size of this and the extraction power of the machine decides how frequently the collection tank will require emptying. All dehumidifiers will stop extracting water when the collection tank is full, so there is never a chance of the collection tank overflowing. Alternatively, most dehumidifiers have auto-drain abilities, which means you can site the machine next to a drain and have the collected water run away automatically, rather than collecting in the internal bucket. Some dehumidifiers purify the air in addition to removing humidity. They can filter the air of bacteria, mould spores and other allergens using filters with special coatings. Some dehumidifiers possess ionisers, which also help to remove these baddies from the air. The EcoAir DD122FW mk5 has both of these features. How important portability is to you will depend on how you want to use the machine. For example, will you be putting it away frequently? Or will it be taking up valuable space in a small area? Desiccant dehumidifiers are typically half the weight of refrigerant dehumidifiers, tipping the scales at around 5-6kg and are generally smaller in size too. This means that they are better suited to small spaces and being moved around frequently. The EcoAir DD122 Mini is a great example of such a machine. It is the lightest and smallest full-sized dehumidifier on the market, weighing just 5.1kg. Domestic refrigerant dehumidifiers start at about 10kg and the very powerful machines can get up to 15kg. As well as weight, the design of the carry handle will decide how easy the appliance is to carry around. Most units have top-mounted handles that are hidden in the top of the bodywork when not in use; these are the best design. Some machines have ‘holes’ that you can use to pick the appliance up. These are not as good as a proper handle as you end up hunched over like a gorilla while carrying the machine from place to place. Finally, some dehumidifiers are mounted on castor wheels to allow the machine to be rolled into place. These are a useful addition, but can look ugly if not hidden behind some sort of skirt. Will the appliance be on display and is design important to you? If the answer to these questions is yes then it’ll certainly narrow the choice of machines available. However these days the manufacturers have raised their game and finding a unit that isn’t an eyesore shouldn’t be difficult. All dehumidifiers make noise, but there is an enormous difference in the amount of noise produced by different models. Particularly when you first switch on a new dehumidifier you will notice extra noise because the machine will have to work hard to reduce the excess humidity. However you should notice that after a number of days, once the humidity levels have been brought under control by the machine, that the noise lessens greatly. Also remember that the machine will not be dehumidifying 24 hours a day, only when the humidity increases beyond the desired levels (generally a few hours each day). If the appliance will be in a ‘noise-sensitive’ location, such as the room you watch television, then choosing the right machine will be very important. Buying a quality appliance from one of the ‘big 4’ brands (EcoAir, De’Longhi, Meaco & Ebac) should ensure that you get a quieter machine. If you want the quietest possible machine then we’d recommend that you go for a desiccant dehumidifier, such as the DD122 Mini, which produces just 32dB and is the quietest machine on the market. The size of your home or the particular room you wish to target. The humidity levels in your home and contributing factors such as drying clothes indoors, long showers, poor insulation, etc. Your desired humidity level. The ideal range is between 40% to 60% relative humidity depending on the temperature and personal preference. The extraction performance of each dehumidifier will be rated in the number of litres extracted per day, but this is not as clear as it sounds. Firstly, these are measured under the absolute ideal conditions for extracting humidity, which is roughly 30°C and 80% relative humidity. Clearly these tropical conditions are very seldom going to be experienced in the UK. The second reason why these ratings can be confusing is because of the difference between refrigerant and desiccant dehumidifiers. Refrigerant machines often have what appear to be higher extraction rates. However, under UK conditions the extraction rates of these refrigerant models usually drop dramatically. This is in contrast to desiccant dehumidifiers, which extract similar amounts at all temperatures and humidities. The rough graph below should illustrate this point. In fact, under UK temperatures, a desiccant dehumidifier rated at 7 litres per day should extract about the same as a refrigerant dehumidifier rated at 14 litres per day. We’ll give more details about the differences between the types of dehumidifiers later. Our dehumidifier reviews will tell you the maximum recommended house size for each appliance on the market and we also list this in our dehumidifier comparison table. Dehumidifiers are not cheap machines, so expect to pay over £100 up to a maximum of £250. If your budget is at the lower end of the scale then don’t fear, the majority of the reviews on this website are for machines of £160 or less and they are more than capable. The DD122FW Simple offers great value at the moment. 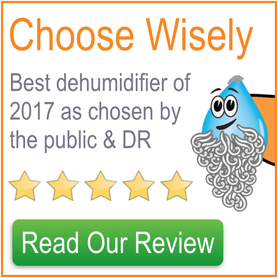 In every dehumidifier review that we create we provide a link to the current cheapest price that can be found. Refrigerant dehumidifiers have been used in homes for over half a century. Based on tried and tested refrigeration technology, they tend to be the most durable in demanding conditions and should last for many years. They are highly effective at temperatures above 15°C. They are not effective at low temperatures below 15°C, such as those experienced in garages, sheds and boats. Recent advances in the design and materials used to produce desiccant dehumidifiers have completely removed the ‘unreliable’ and ‘not very effective’ tags that in the past they had been justifiably given. This is really great news for the consumer, as desiccant models have advantages over refrigerant types. Models are lightweight and are hardly audible on low settings as they don’t require a compressor. They also operate effectively at low temperatures. They may not last as long as refrigerant types. Sometimes they can suffer from a burning smell during the first use, but this almost always disappears after a couple of hours. 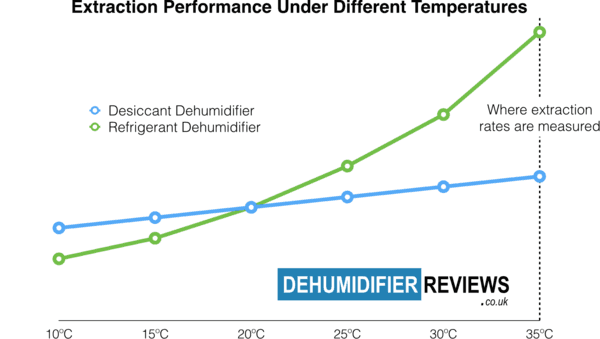 Peltier dehumidifiers work through thermoelectric cooling. A current is passed through two materials and heat flows from one to the other, thereby creating a cool plate to condense water, without the need for a compressor. NOT RECOMMENDED. They can be extremely inefficient and weak; they will struggle to affect the humidity of a room. Possibly one day the technology will improve and we’ll all be using them, but certainly not for the time being. There are literally hundreds of different cheap products you can use to dry out your wardrobe or similar space. The most popular at the moment is the Unibond Aero 360 Pure. They all work through desiccant material similar to that you’d find in a desiccant dehumidifier and you can sometimes ‘recharge’ them in the microwave or with a hair dryer.